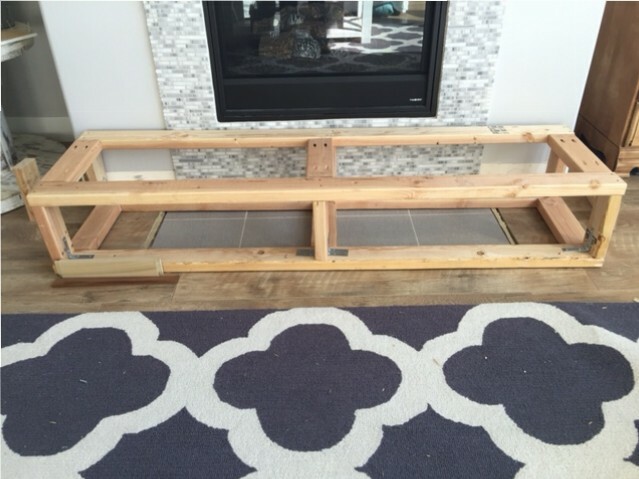 This part gets really mathy: I measured out the width of the fireplace area and subtracted 3 inches, 1 1/2 for each side to allow for 3/4″ MDF and 3/4″ trim. It was a bit tricky to be precise here because we have rounded corners so there’s no exact spot to measure from. I tried to measure right before the rounded edge started, I think it was about 68 inches or so, but obviously you will take your own measurements. I also made the depth of the hearth just enough so that the 2×4 sat right in front of the floor tile. It’s about 20 inches. Then I built a structure like this. Pocket holes for the bridge pieces to connect the two frames, the two frames I used 2 1/2″ Spax screws (which are my favorite because they self drive easily into the wood using an impact driver.) I also used glue on the joints. I additionally added metal brackets on the joints to help prevent it from ever swaying side to side since it’s a free-standing structure. It literally looks amazing. I wish I had room in our teeny little farmhouse for a mantle. Maybe someday when we build a home. Great articles – gorgeous site. Thanks! I honestly don’t know because we chose it at the design center of our home builder. Sorry that’s not very helpful!